Scale: 1:48. The 'Jervis Bay' (1922) was one of five passenger vessels built for the Australian Government and Commonwealth Line to operate between the United Kingdom and Australia. From 1922-1928 she was operated by the Aberdeen Commonwealth Line. At the beginning of the Second World War she was converted for use as an armed merchant cruiser and, it was in this role, commanded by Captain E. S. F. Fegen that she was sunk while shielding a convoy from the German pocket-battleship 'Admiral Scheer'. The warship had reached the Atlantic from the Baltic undetected, and sank a lone British merchant ship, the 'Mopan', on 5 November. Unfortunately the merchantman was not able to send out wireless warnings and, towards evening, the raider caught the homeward-bound convoy, HX84, from Halifax, Nova Scotia. It consisted of 37 ships escorted by the 'Jervis Bay'. The convoy scattered and made a smoke screen, while Captain Fegen turned his 6-inch guns against the 'Admiral Scheer's' 11-inch main armament. The raider's third salvo disabled the 'Jervis Bay', wrecking the bridge and severely wounding Fegen, but his ship, burning fiercely and listing heavily, continued to engage the enemy. She was last seen about seven o'clock and sank soon afterwards. The Swedish ship 'Stureholm' returned to the scene and rescued 65 of 'Jervis Bay's survivors. Two-thirds of her crew had been merchant seamen with no experience of battle, but their devotion to duty showed that the Merchant Navy could live up to the best traditions of the Royal Navy. 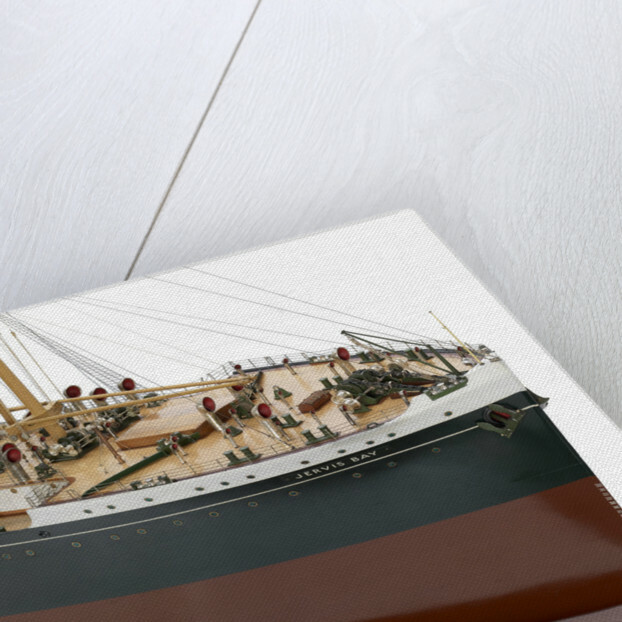 The model is a fitting tribute to the ship and the men that served in her and it's beautifully presented in its case mounted on four turned pillar supports. The metalwork on the model is very fine and the paint finish, though executed by hand, is virtually flawless. 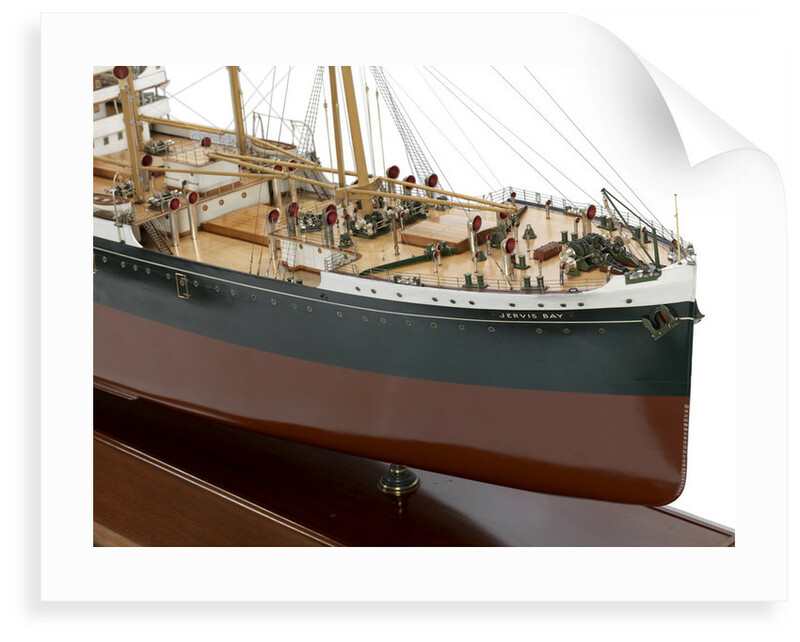 The hull is carved from a solid piece of wood and is painted in realistic colours. 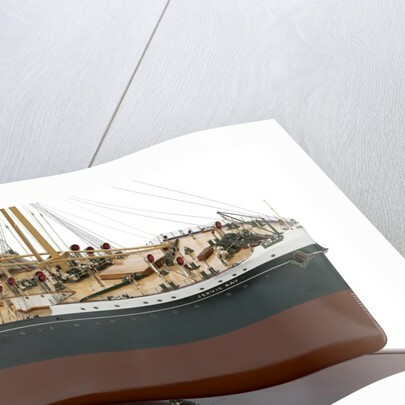 The hull is brick red below the waterline and black above with white painted bulwarks and a fine white stripe at main deck level running the entire length of the hull. The hull is flat bottomed with bilge keels and there are two four-bladed propellers. There are 10 watertight doors on the port and starboard sides with gold plated edges and hinges. All the decks are actual, or simulated wood, scored to resemble planking and hatch covers. The foredeck includes a large cargo hatch, a foremast with derrick booms, four derrick winches, a wave deflector, and a large windlass and crane at the bow. The forward cargo deck has a single rectangular hatch. There are six tall ventilators, all silver plated, with red inserts. 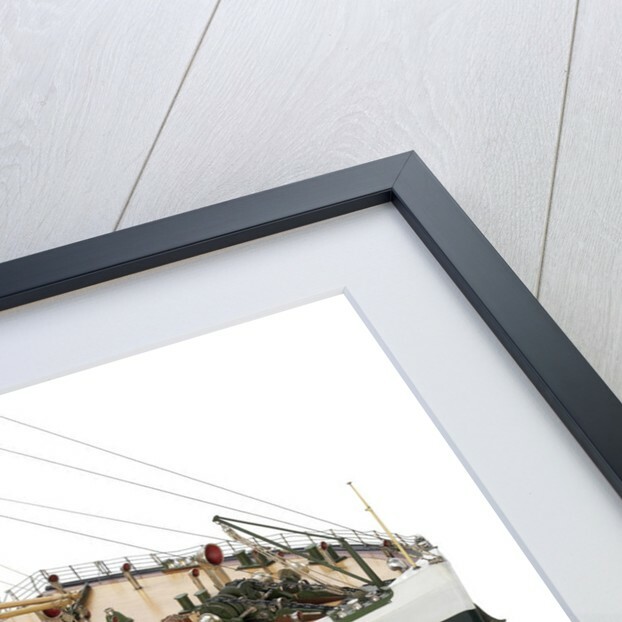 The main superstructure is placed amidships and there are a total of 16 boats, all rigged to davits, with white hulls and brown painted fittings. There are four derricks forward and a single cargo hatch. The bridge is on two decks with an enclosed observation cabin and an open bridge area above. There are four telegraphs on deck and other fittings include fire buckets and radio equipment. The single funnel is positioned amidships and is painted yellow with black inserts. A large number of squat ventilators are clustered around the funnel and are all painted yellow with red inserts. The mainmast is positioned at the aft end of the promenade and is rigged with four derricks and there are hatch covers fore and aft of it. There are companion ladders rigged close to the port and starboard quarters. There is a secondary bridge at the aft end with a small ship's wheel, telegraph and binnacle. At the stern there are two pairs of green painted bollards, a capstan, and an ensign staff. More by the artist Vickers Ltd.